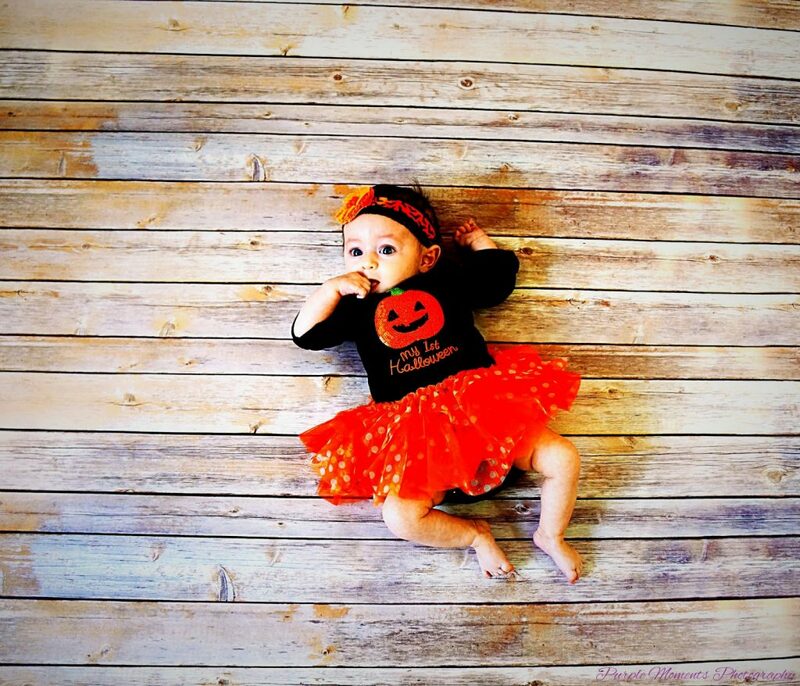 I am still trying to convince myself that, yes, Hallie is in fact 3 months old already and I am not in a dream! She is just getting too big, too fast! But these cute photos did a great job helping me come to this realization! 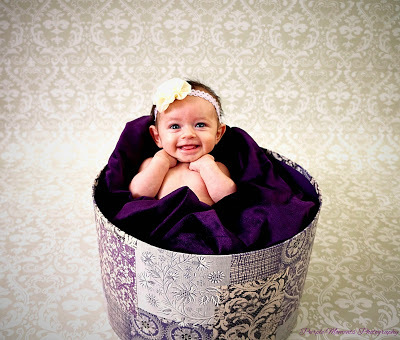 I hope you enjoy, and again, many thanks to Purple Moments Photography! Hope you enjoyed! Happy Tuesday! Happy Monday!! I hope everyone had a wonderful weekend! Ours was awesome! 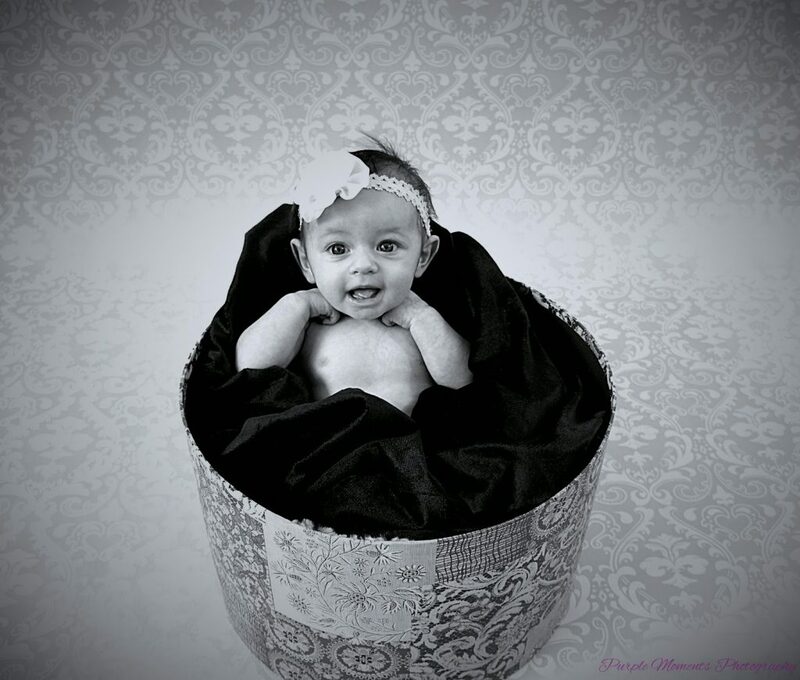 Hallie’s pictures went GREAT despite the crazy morning before them! I can’t wait to share them with you! We should get them on Tuesday, so be looking for them later in the week! Also I may have a new snazzy Blog Cover photo too! Many thanks again to Larissa with Purple Moments Photography! We also got to spend a TON of time with Christopher’s Mom/Memi! Here are some cute pics of Hallie with Memi and Pop. Now on to Monday! For today’s Must Have Monday, I thought now that we have reached the 3 month mark, I would share with you some of the products that we couldn’t live with out in our first 3 months! Some of these products I have shared with you before, but they are just THAT important guys! 1.) The Fisher Price Rock n’ Play Sleeper– This sleeper is awesome! It is the perfect height to put by the bed while they are small AND it vibrates and rocks! Now that Hallie is in her crib, we don’t use it for sleeping, but FUN FACT…she is happily kicking away in it next to me, RIGHT NOW! 2.) Carters Newborn and Preemie sized onesies. 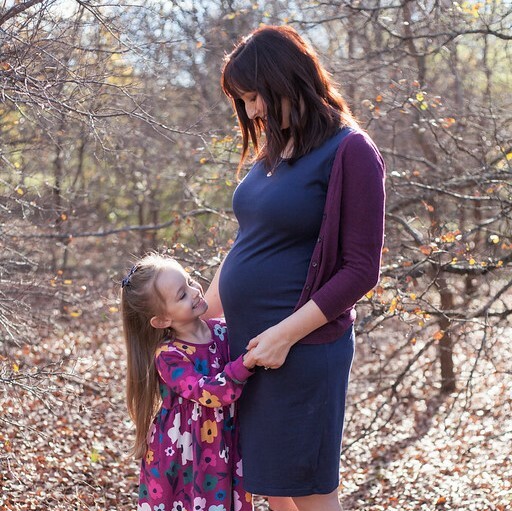 If your little one is long and skinny like mine…these will be the ONLY ones that fit just right! 3.) Pampers Sensitive diapers– These have been great because Hallie has always been a great sleeper, and I don’t have to worry about her getting a rash from staying in the same diaper while she sleeps for a long time. 4.) Board Books…any and all board books! 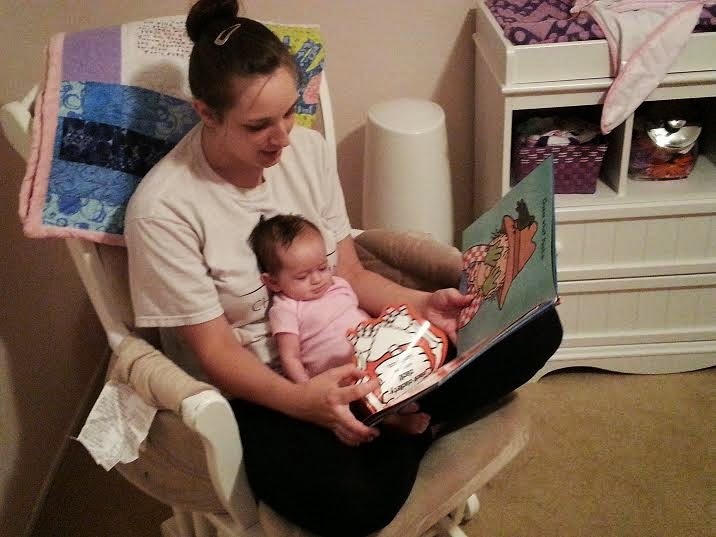 Room on the Broom is a favorite right now, but Hallie just LOVES to be read to! She stares at the pictures and has recently started cooing back! So cute! 5.) Dr. Brown Bottles– This brand it great! Especially for gassy babies! 6.) Chicco Key Fit 30 Infant seat- LOVE our carseat! I especially love how padded the infant cushion is because of how little Hallie was in the beginning! 7.) Halo Sleep Sack Swaddle- OKAY I’ll admit, I was pretty skeptical of this contraption at first, and I still think it’s kind of ugly and HATE covering up Hallie’s cute PJs, BUT IT WORKS! She can’t kick out of it, and sleeps infinitely better with it on! 8.) 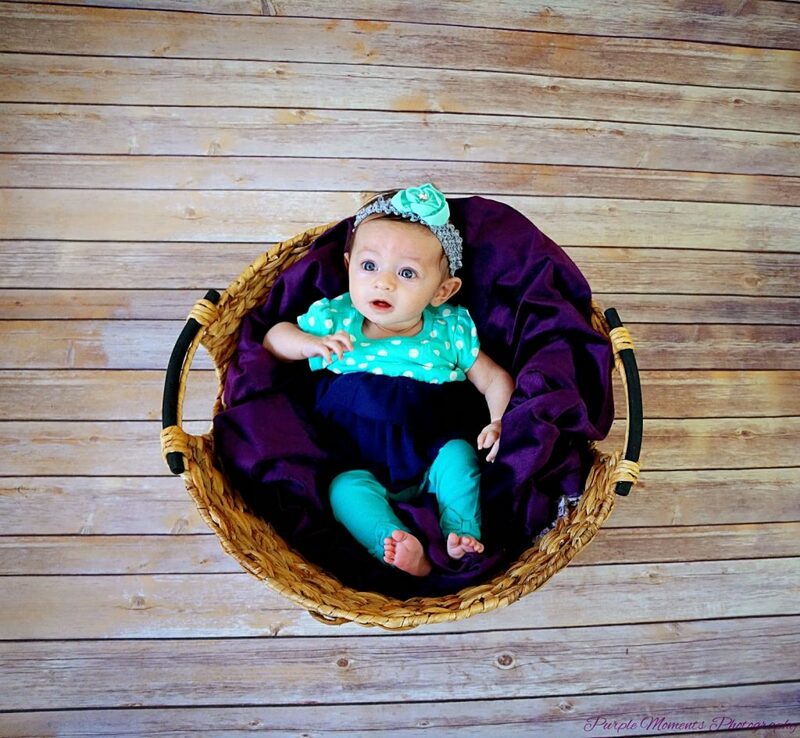 Skip Hop Owl Activity Gym– It makes tummy time a little better for a baby who hates it. It has mirrors and a lot of cute toys and places to attach rings! 9.) Avent Soothie Pacifier- These dumb things were the ONLY pacis Hallie would take FOREVER! They are ugly and cover her whole face, but she loves them! 10) Kate Quinn organics receiving blanket- This blanket is so soft! And Hallie loves it! 1.) Coffee! I really don’t care what brand for the most part, but Dunkin Donuts is my FAVE…and trust me..I bleed coffee..especially now! 2.) My planner!! I know, I know! I’ve told you before, but seriously this brand! It has a grid system, so I can keep work separate from my personal life, separate from Christopher’s schedule and Hallie’s schedule! AMAZING! 3) High Rise Leggings from Forever 21– I love how these stretched with my baby belly before and after pregnancy while I worked on getting back into jeans! 7. )Thermos Intak water bottle– I love how there is a dial on the side that counts how many times I have filled it up, so I can make sure to drink plenty of water, while nursing, and now while I am still attempting to lose that baby weight! 8.) Ouchless hair ties- Love these from Goody because they are cute and people might not notice that you have spit up in your hair…ha! Just kidding, but seriously, these are great! Best part..they dont leave creases! 9.) Coach Diaper Bag– LOVE THE POCKETS! 10.) Motorola Video Monitor– This one is cool because you can move the camera around on the handheld device in case baby moves in the crib. It also has a microphone so you can talk to baby from another room! What were your must- haves in the first few months? Ps…I am now on BlogLovin…check it out and don’t forget to follow me there or by email! Oh hey, Friday! 5 Things that have me excited today! Hello readers and Happy Friday!!! Are you as ecstatic for the weekend as me?! Good! I seem to be extra bouncy today! I don’t know if it’s because it’s Friday, and we have so many fun things to look forward to today and into the weekend, or if it’s the weather, or the fact that my adorable daughter is giggling and cooing at me more and more and it melts this mommy’s heart clear to the floor! Whatever the reason, here are 5 things that have me excited today! 1.) We got Hallie’s Halloween costume in the mail yesterday!!!! Wahooo!!! I cannot wait to reveal it to you in October, but just know 2 things! 1. It is FREAKING ADORABLE and 2. I will be writing a review on maker of said costume sometime in October, so be looking out for that! 3.) My Mother In Law (Don’t you hate that term! It always sounds like it has a negative connotation even though mine is a saint!) is coming in tonight for the weekend! I REALLY hit the jackpot of Mother’s In Law you guys! She is so sweet, thoughtful and always so helpful, and definitely where my wonderful husband got his sense of humor from! Ps. She did an amazing job raising him! 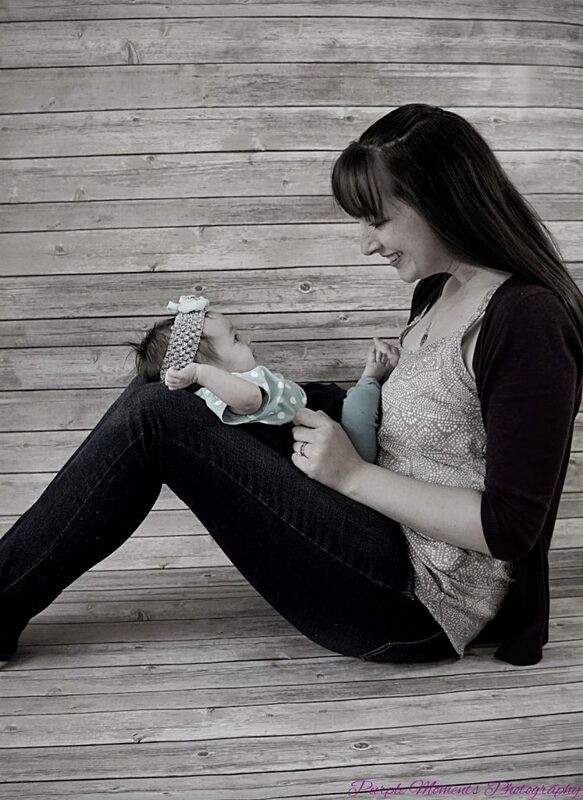 Hallie cannot wait to spend some time with her Memi, and I am looking forward to it just as much! 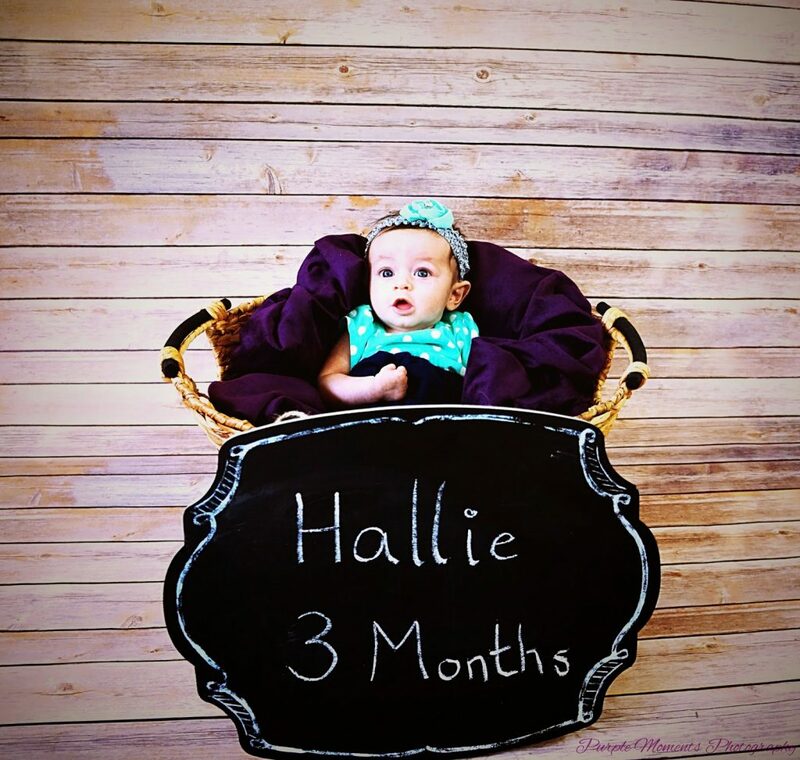 4) Hallie’s 3 month pictures are in the morning! I still cannot believe 3 months have flown by! It still feels like yesterday that I was sitting in my hospital bed with a basketball for a belly imagining what she would look like…I never imagined she would be this perfect! I can’t wait to share these photos with you once we get them! As I mentioned before, one of the sweet Moms from our playgroup is going to do them for us! If you are in the Dallas area, you should check her out. She is an aspiring photographer and offering a really REALLY good introductory rate! 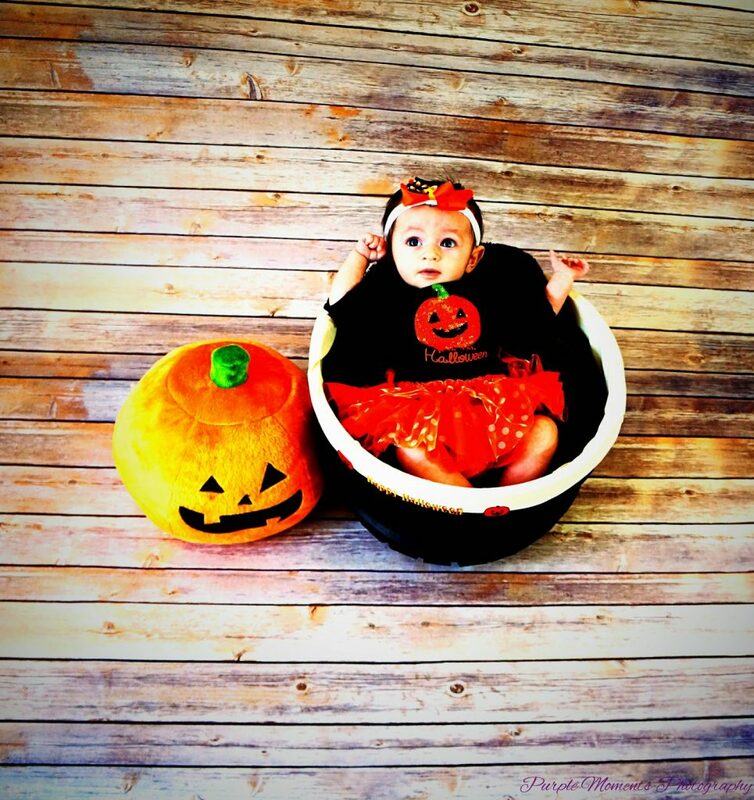 And she took this awesome picture of my baby girl! 5.) On Sunday I get to catch up with my cousin Karley! Love this kid! We are going to grab some lunch and chat, I’ve missed her so much! Aaaand since it is Flashback Friday…here is a picture of us from way back when…. I hope everyone has a great weekend planned! Can’t wait to follow up on Monday!!!! X’s and O’s and all that! 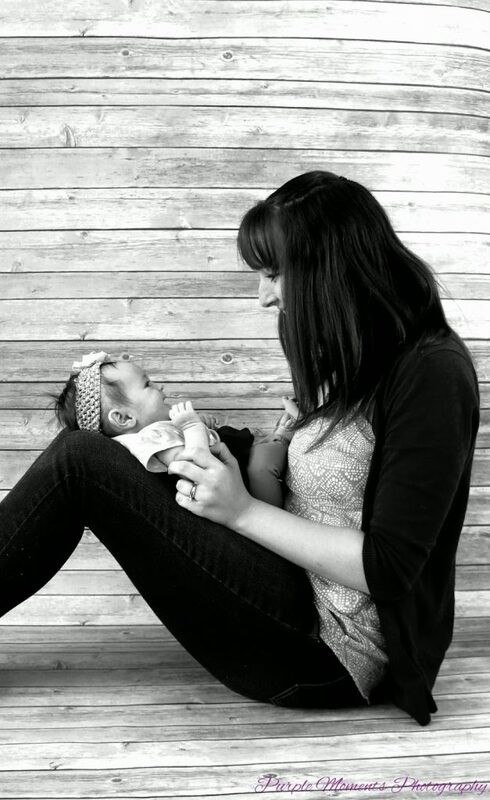 Yesterday Hallie and I met up for a play date with my friend Parisa and her adorable little girl Darya! Before we left Daddy snapped a few pictures of his girls! First we met up at the carousel in the mall so that the girls could have a ride. Darya was so cute! She had her BIG brown eyes set on the pony she wanted to ride on as soon as she arrived! After our fun ride, we went to the Barnes and Noble cafe and had coffee and lunch. (So actually funny story, that’s where Parisa and I met. We both worked their in college. Even funnier story….our husbands went to Elementary school together!) So anyway, while we chatted over coffee, Darya happily colored and Hallie took a little nap. It is so nice to have friends with kiddos! Parisa is also putting together a book club that I cannot wait to join! a) I love reading and b) As much as I hate being away from my baby, it will be nice to get some Mommy time every now and then! So thank you Parisa for giving me the opportunity to get out every now and then! I am thrilled to be joining! So in other randomness…because that is how this post has felt…. This little one taught herself how to go to bed on her own yesterday! We put her in her crib awake around 8pm after a bath,and by 8:15, she was out! She didn’t even wake up until 6am! I feel half…no 98% blessed and 2% scared that she is going to stop being the angel she is at any minute and get tough…oh terrible twos..I am sure will hit us hard! But for now I will enjoy the good sleeper we have and live it up by giving myself Jamicures, drinking wine and enjoying the Parenthood premiere tonight! P.S. Latest Jamicure! What do you think? Boysenberry Chevron and Icy Boysenberry Polka! I can just see our phone bill now! We are in trouble if she’s already making calls now! Hey, while I have you here: Check out my Mom’s new blog about her journey with colon cancer. She has been so strong and would love the support! 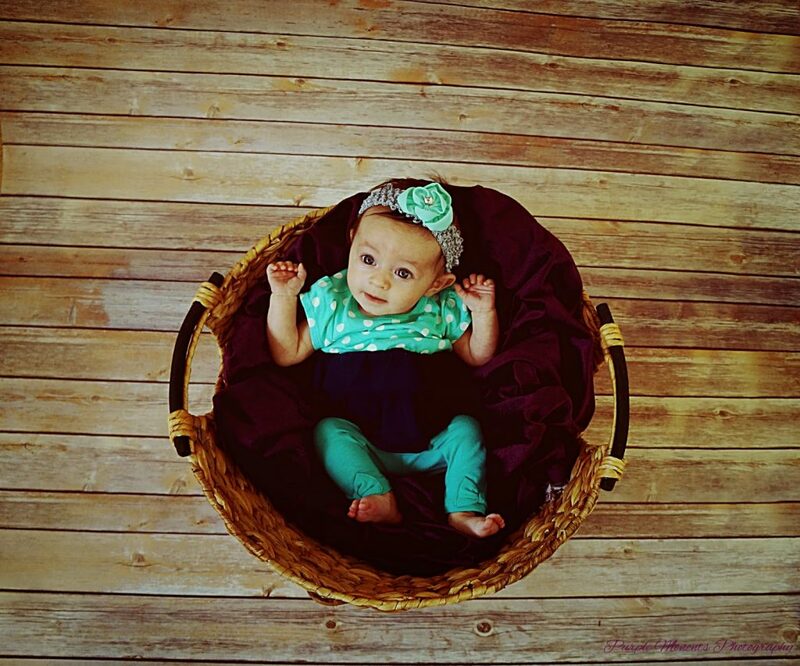 Hallie Anne turned 3 months old this weekend! I cannot believe it has been 3 months already! 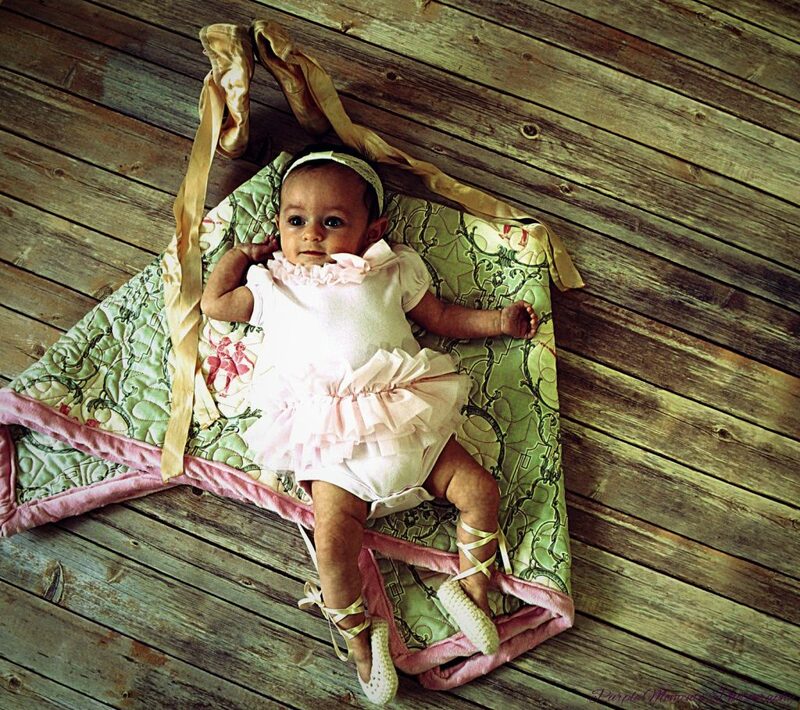 Though still in her newborn clothes, she has grown SO much! I pulled out one of her preemie onesies that was too big for her when we brought her home and held it up to her the other day. It looks like dolly clothes and is hard to believe that it ever fit on her, let alone that it was baggy! And now some of my BIG 3 month old girl! It’s insane to see how much she has changed from that wrinkly little newborn to now! Weight- When I made her chalkboard I was going off her weight a few weeks ago! I took her in yesterday…girlfriend is 9 lb 4 oz! Granted that was with clothes on, but still! I bet she is definitely over 9 for sure! Length- We didn’t measure length yesterday, but last we checked she was 21 1/2, so my guess is 22 1/2! Size- We are still in newborn diapers and onesies. Even the 0-3 month ones swim on this girl! She is just sooo skinny! Now with her PJs, I just pulled out a lot of the 0-3 month for her length! She is so LONG! Eyes- Still blue! I am holding out hope that they stay that way! She just melts my heart when she stares up at me with those HUGE blue eyes! Even if they do change I will never forget the way they are today! Sleeping- This chick loves her sleep! We got the crib thing down! I usually put her in her crib between 7-8pm and she doesn’t make a peep until 5-6am! We go about 10 hours! I actually start to miss her! During the day- She also will want to go down for a 1 hour nap about an hour after her first morning bottle..clearly 10 hours isn’t enough y’all! I can also expect short naps throughout the day with a long one some time in the afternoon. Milestones- She can hold in her paci, recognize mommy and daddy from a distance (when she sees us, she smiles so big! 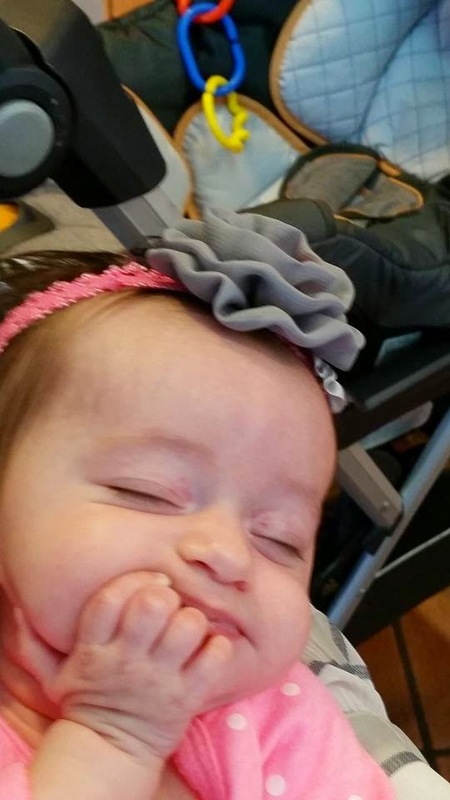 ), She giggles a little more now…still waiting for her to roll over…Mommies, when did your little ones do this? Memorable outings- Trip to Houston to meet Daddy’s family, Balloon Festival, Play group and story time! Favorite toys/activities- Do ceiling fans and mirrors count?! Lol She loves looking at “the baby in the mirror” and could stare at a ceiling fan ALL DAY! She also likes her zebra toy and rings! LOVES to be read to! Words/sounds- She is kind of starting to imitate sounds and if you haven’t seen this video, go watch it now! She just cracks me up! Nicknames- I call her sweet pea, sweet girl or Hal…Daddy likes to call her Daniel son when I put headbands on her…but other than that sticks to a generic sweetie or cutie! Funny moments- This video y’all I seriously can’t get enough of it! Looking forward to- watching her learn new things and spending the upcoming holidays with her! 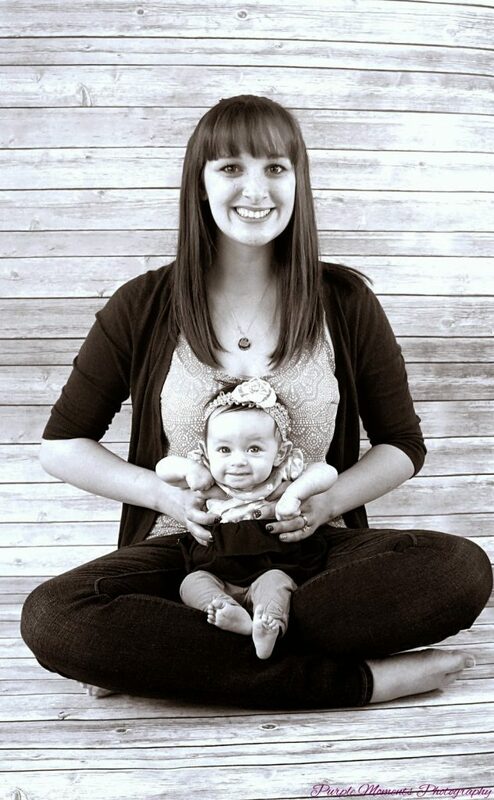 So much more magical with a baby! 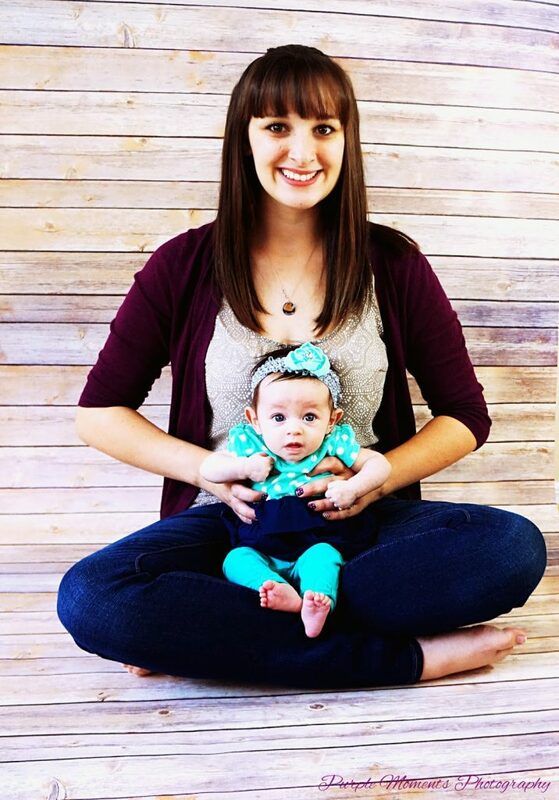 We have 3 month pictures this weekend with a Mommy from our Play group! She is an aspiring photographer and offering a really good deal…otherwise I probably wouldn’t get them done, but I can’t say no to pictures of this girl! Can’t wait to share them with you! This Saturday, Hallie and I woke up super early, put on her cute new outfit, and went to one of my most favorite event here in my home town! THE PLANO BALLOON FESTIVAL! We went with my Mom and Dad and the morning couldn’t have gone more smoothly! 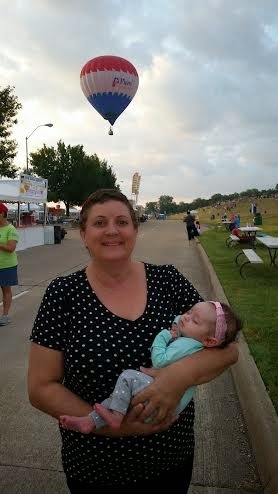 Hallie napped in her stroller and we drank coffee and watched the sun rise as we waited for the Balloons to launch. Soon after they began to go up, Hallie woke up and we were able to get some pictures of her experiencing it all for the first time! I was so happy to watch her little amazed face taking in all of the colors! I mean it has always been incredible and so fun, but there was something magical about watching my daughter experience my favorite home town tradition for the first time! I hope you enjoy these pictures! Sorry there are so many, but It was the best time ever! She was just so amazed! Look at that amazed little face! Hallie also turned 3 months this weekend! More on that soon! Hope everyone else had as a fantastic of a weekend as we did! What did y’all do!? Some of my readers have been curious about the Jamberry Nails I have been talking about! Jamberry Nails are vinyl nail wraps that are applied with heat and pressure. They come in hundreds of styles and last on your nails for up to 2 weeks! (6 on your toes!) They are water resistant, there is no dry time, no chipping, vegan and latex and chemical free! There are styles for all woman and kids! Here is the application process. I like to cut them right at the nail so they last longer. I also use olive oil for removal because it is the safest for your nails! Check out some of these other reasons I love Jamberry! 1. They are cost effective: You can get 2-3 nail applications and 2 toenail applications from 1 sheet!!! They are also always B3G1 free! 3. There are seriously styles for EVERYONE! 4. Jamberry Celebrates the holidays and seasons!! And let me know if you have any questions! Oh Hey, Friday! Pics from the week! 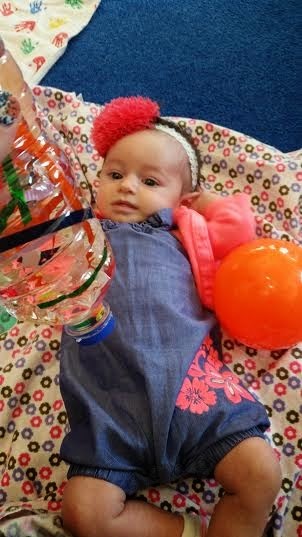 This week has been super busy and filled with fun outings from Story time to play group! The fun doesn’t stop this weekend, because it is time for the annual Plano Balloon Festival!!! So pumped for that! Today Hallie and I will be having lunch with her Nana and Bapa, so that will be fun too! 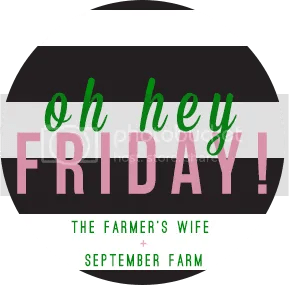 So for today’s “Oh hey, Friday” post, I thought I’d keep it simple and share some of my favorite pics and a video from the week! 2. Monday- Minnie Mouse came for a visit this week! I have been WAITING and WAITING for this cute little outfit from Joyce to fit her since she was born! It’s still pretty big, but I couldn’t help myself! Look at that face! 3. Wednesday- BFF’s just chilling! I love how Stella likes to give Hallie kisses! 4. Thursday- After bath snuggles! Is she not the cutest elephant you have ever seen?? 5. Thursday- Took this video in the car waiting for the big girls to get out of school! This baby is really the happiest baby I have EVER met! I am a little worried that when the two’s roll around all hell will break loose, but until then, I am enjoying my easy, happy girl!!! So this morning we have been taking it pretty slow! Snuggling and jamming out to Disney tunes on Pandora- Hallie’s favorites so far: Be our Guest- Beauty and the Beast (Yay because that’s Mommy’s fave!) anything Lion King and Reflection- Mulan! We hope everyone has a wonderful weekend! Can’t wait to fill you in on ours!!! Yesterday I took Hallie to our local library. They do a special story time for babies 0-9 months, which is perfect because I really want to instill a love for reading in her! I love to read and hope that this is one quality she gets from me! This story time was great! It was full of songs, rhymes and movement. 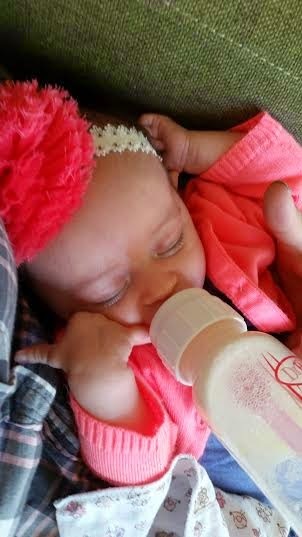 Unfortunately Hallie was a little fussy, so we did most of it one-handed so I could give her a bottle to keep her happy! This is Hallie enjoying her bottle and Old Mc Donald! To do the sign “Again”- Use your non dominant hand and lay it palm up. Then take your dominant hand and bend at the knuckles in a 90 degree angle. Tap your fingertips repeatedly into your palm. We used this sign a lot because she did each rhyme or song 2x, Another thing I LOVED because I have always heard that babies learn through repetition! After the books and rhymes, the librarian brought out toys for the kids to play with. Balls, toys and these really cool bottles filled with water, oil and food coloring or beads! Hallie LOVED these and I am so going to make her one! She also loved when the librarian went around blowing bubbles! They were definitely a BIG hit! I am also now a proud owner of a library card! Okay okay…before you start thinking “Holy COW this lady doesn’t have a library card? !”The card I was holding was from my parent’s city, just one city away from ours. I lived there for a while in college and was still driving back and forth whenever I wanted to go to the library…which I’ll admit, since graduation, hasn’t been much! But today I got one for our city and Hallie and I were able to get some good books! I got a Hester Browne novel: “The Runaway Princess”. I hope it’s good. I really enjoy British novels and until the new Sophie Kinsella comes out, I’ve read all of hers! If anyone has any other book suggestions, I would love to hear them! After all, I have a library card now! Nails: Glam by Jamberry I love that they are metallic! What do you think? 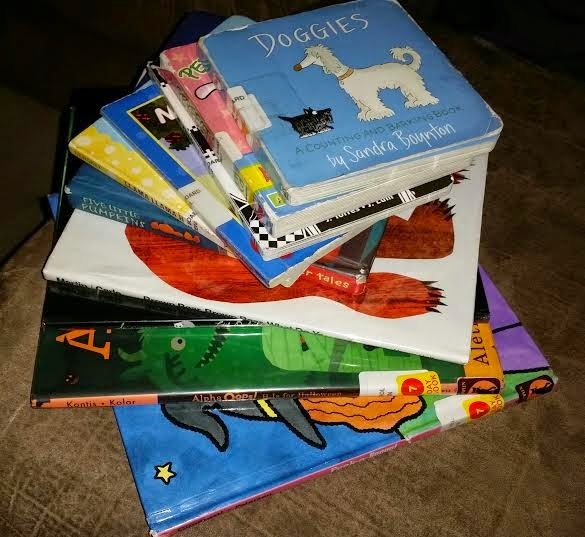 I went a little overboard with books for Hallie…we got 10! But I just couldn’t help it! I love reading to her, especially at bedtime! I know she probably doesn’t understand just yet, and maybe she can’t even fully see the pictures, but she does smile at the rise and fall of my voice, and I am creating beautiful memories that I will cherish! 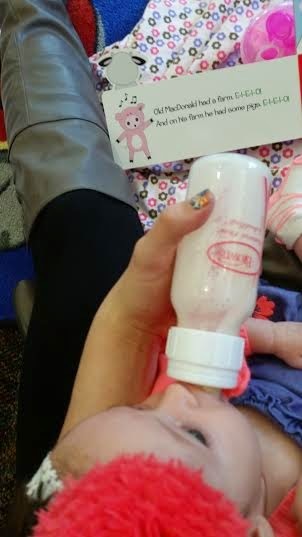 Do you enjoy reading to your kiddos?